"So how are the ninth graders?" my principal asked me a few days ago. I'm teaching in the summer bridge program for our incoming freshmen, so I'm in a position to know. "They seem nice," I said. "Haven't had any issues. I mean, the ones who are here voluntarily over the summer probably aren't the tough cases, but the kids who are here are all right." "Can you figure out who the class clowns are yet?" he asked with a laugh. "Oh, definitely," I assured him, laughing back. POTENTIAL CLASS CLOWN, to MISS EYRE: So what do you teach? PCC: Well, you know, you look like an English teacher. PCC: You know. Like a brainiac. ME: Um, because math teachers or Spanish teachers can't be brainiacs? PCC: No. Like an English teacher brainiac. You know, with the glasses and everything. ME: Well, I have to say, this is the first time I've been told I look like a brainiac. [Incredibly enough, this is true.] Usually I just get that I look like a student. PCC [attempting to be reassuring and failing miserably]: Oh no. You don't look like no student. You look old. PCC: Oh, like old. Like maybe 30. ME: I think I liked my old freshmen better. They said I looked 24. ANOTHER STUDENT [catching on]: No, she's not 30! She's like...27. ME: See? Now, if I have her, she's getting an A all year. PCC: It doesn't matter! You're just old! 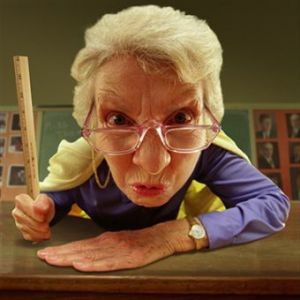 OTHER STUDENT [clarifying]: ALL teachers are old, miss.